A pair of NFC North rivals will clash at Soldier Field in Chicago, Illinois Monday night when the Chicago Bears entertain the Minnesota Vikings. The Vikings won the last meeting 38-17 as a 4-point favorite home in Minnesota on December 20 last year. You can watch the game live on ESPN nationwide. The Vikings are once again favored by four points for this clash as the spread have dropped from the opener of five points. That is despite close to 80 percent of the tickets firmly behind the Vikings while the total have dropped half a point from the opener of 41 points. Minnesota suffered its first loss of the season (both straight up and against the spread) last week. The Vikings headed into Philadelphia coming off a bye week, but failed to make the most of their rest advantage as they fell 21-10 as a 3-point road favorite. They held the Eagles to just a total of 239 yards of offense, but the Vikings own offense was not much better with a total of 282 yardage. Quarterback Sam Bradford got exposed by his former team and was just 24-of-41 passing with a touchdown and a pick, one of a total of four Minnesota turnovers. The Vikings very much rely on a defense that is limiting foes to an NFL-low 14.0 points. Vikings are 6-0 ATS vs. a team with a losing record. Vikings are 13-3 ATS in their last 16 road games. Vikings are 1-7 ATS in their last 8 Monday games. Under is 6-1 in Vikings last 7 games following a straight up loss. Under is 10-2 in Vikings last 12 vs. NFC North. Over is 5-2 in Vikings last 7 games after allowing less than 250 total yards in their previous game. The Chicago Bears have just one win on the season and they’re coming into this game on the back of three consecutive defeats. They’ve failed to cover the spread in each of their five losses and were outgained by a total of 217 yards in a 26-10 loss at Green Bay in Week 7. Quarterback Brian Hoyer suffered a broken arm in the defeat and we’ll see Jay Cutler return to action under center for the first time in six games tonight. Bears running back Jeremy Langford could return from a sprained ankle that has kept him out for the past four games. Bears are 1-7 ATS in their last 8 games following a straight up loss of more than 14 points. Bears are 7-16 ATS in their last 23 vs. NFC North. Bears are 5-11 ATS in their last 16 games in October. Under is 4-1 in Bears last 5 home games vs. a team with a winning road record. 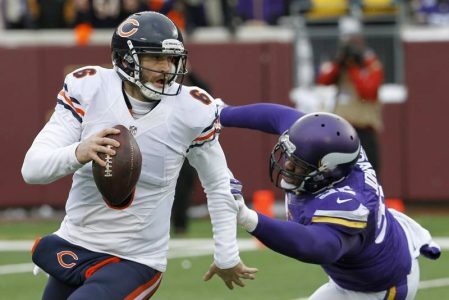 Under is 5-1 in Bears last 6 vs. NFC North. Free Picks: 6.5-point teaser on Minnesota Vikings and Under. The Vikings should be able to generate enough offense to beat the bad news Bears, but we don’t expect touchdowns to come easy for either side.